Paper-based calibration practices are costly and time consuming and they increase the risk of human error and non-compliance. Are you aware that a ProCalV5 system enables you to perform off-line calibrations without the need for Wi-Fi or internet? Watch our newest video below to learn more! 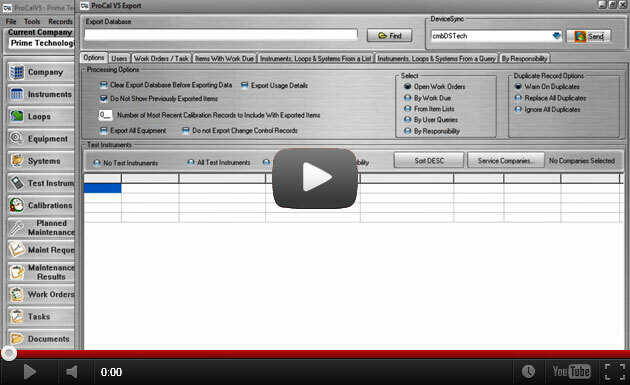 As shown in the video above, Mobile Workstation presents to technicians the full ProCalV5 program interface. Even better, work assignments can be further delegated and managed to and from Fluke calibrators from the mobile device. Workstations are validated, 21 CFR Part 11 compliant. Work assignments can be further delegated to multiple technicians using their own tablets and calibrators. Technicians performing calibrations experience the benefits of the full ProCalV5 program interface. While off-line, those with appropriate authority can edit existing records and add new records. Paper documents for calibration worksheets and maintenance work assignments can be printed from the Mobile Workstation. Even calibration stickers can be printed in the field. Test standard records, SOPs, etc. can accompany exported assignments. The system incorporates sophisticated controls to manage potential conflicts and duplication when importing back completed calibration and maintenance data. Click Here To Get Started Using Mobile Workstation! Need help with your ProCalV5 system? We are always here to assist! Next Post! New Articles & News Automatically! Copyright © 2018 Calibration Management Software – CMS – ProCalV5. All rights reserved.